In addition to getting asked for my American buttercream frosting recipe, I also get a ton of other questions about buttercream! How should I store leftover buttercream? Can I make buttercream frosting in advance? How far ahead of time can I make frosting? Does frosting go bad at room temperature? How long can frosting sit out at room temperature? How long does frosting last in the fridge? Does frosting need to be refrigerated? How do I soften refrigerated buttercream? How do I get rid of the tiny air bubbles in my frosting? So I’m here to answer these questions in one place, to make all our lives easier!! I’ll cover everything you need to know about making frosting in advance. And the answer is YES! In fact, I almost always make my frosting ahead of time. I also love to save leftover buttercream, to try to repurpose in future baking projects. I even have a drawer in my fridge dedicated to leftover buttercream! This might be a bit over the top, but I bake enough where it’s worth it to have lots of colors of frosting on hand. When stored properly, buttercream frosting can last in the fridge for up to a month, and in the freezer for up to three months. 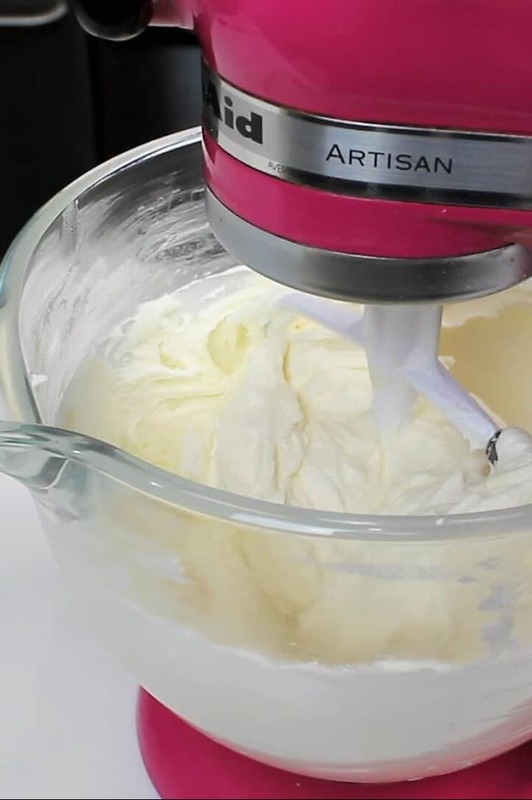 Why would you want to make buttercream ahead of time? To make cake decorating is more enjoyable. When you make your frosting and cake layers ahead of time, all the hard work is done beforehand! That way you aren’t totally exhausted when it comes time to decorate a cake. Instead, you get to put all your energy into creating the most beautiful cake you can. Whether you made a batch of frosting in advance or have leftover buttercream, it’s important that you store it correctly in the fridge or freezer. The most important thing is making sure the buttercream is protected from the air! 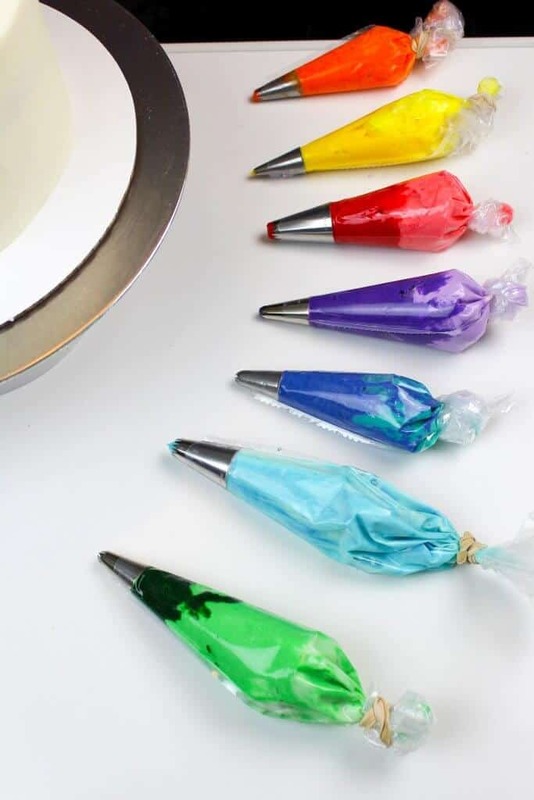 Frosting can be placed in a piping bag sealed with a rubber band, or an air-tight container. If the frosting is only being made a few days in advance, it can also be covered in a bowl with plastic wrap placed flush against the frosting. When you’re ready to use chilled buttercream, simply take it out of the fridge, and place on the counter to thaw. If you’ve frozen your buttercream, transfer it to the fridge a couple days before you plan to use it. This will allow the frosting to thaw gradually, and minimize the temperature shock. The amount of time it takes to thaw can vary based on the amount of frosting, and how it’s stored. If stored in a large container or bowl, the buttercream can take several hours to soften. When I plan to bake first thing in the morning, I usually take my buttercream out of the fridge and leave it on the counter the night before I need it. Once the buttercream has reached room temperature, it will likely have tons of tiny air bubbles in it!! 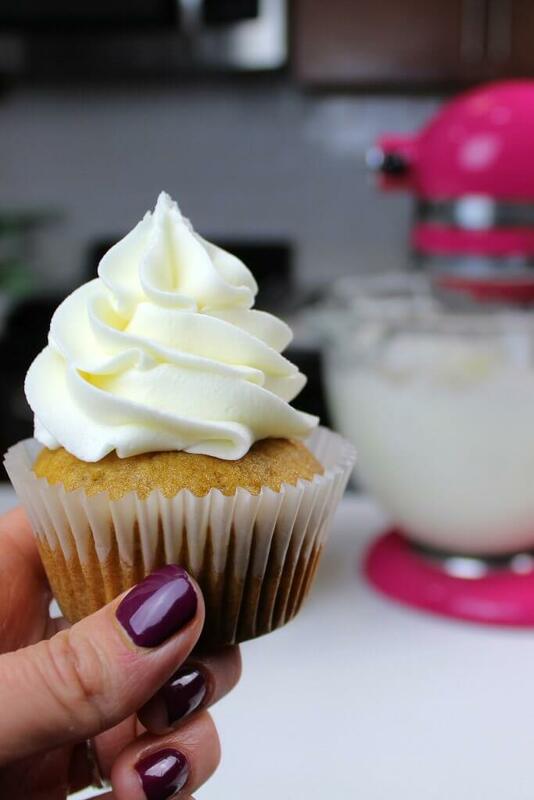 Don’t worry, you can get your frosting back to a silky smooth consistency. Simply mix it on a low speed with a paddle attachment, or by hand with a rubber spatula. Mix or stir the frosting for a couple minutes, until the air bubbles have been pushed out of the frosting. I do this with every batch of buttercream, to make it easier to get super smooth sides on my cake. I swear by using a flexible spatula, and working the frosting around a bowl by hand. In general, buttercream can sit out at room temperature for up to 2 days. And the simple answer is no. The high amount of fat and minimal amount of cream keep it from spoiling. There’s more to the science behind it, but I’ll save that for another time. I leave my frosting out overnight all the time, and I’ve never gotten sick from it. At first I was scared to do this, but now it’s a pretty common practice for me. Why Is My Frosting Hard / Why Does Buttercream Crust Overtime? Another important thing to note when making buttercream is that it will crust if left exposed to air for an long period of time. My frosting recipe crusts overtime if left exposed to air, due to its high sugar content. But it’s really not a bad thing. In fact, most of the time it’s actually a great thing for decorating and piping. If I leave a bowl of buttercream out overnight, I place a piece of plastic directly on top of the frosting. I press it into place, to ensure that no bit of frosting is left exposed. I hope this answers your questions on making buttercream in advance! If you still have any questions I didn’t address in this post, please ask them in the comments section below. How do I prevent my buttercream from crusting while I’m smoothing it on my cake? I’ve heard it might be bc my cakes are too cold bc I take them right out of the fridge when I frost them. Any tips would be much appreciated. Thanks! crusting is usually caused by buttercream being exposed to air for too long! if you chill your crumb coat in the fridge for a while, I’d recommend placing plastic wrap directly over your buttercream, to prevent it from crusting in the bowl. I’d then give it a really good stir before adding it to the chilled, crumb coated cake! I frost chilled cakes all the time, and that usually doesn’t cause any problems with crusting. 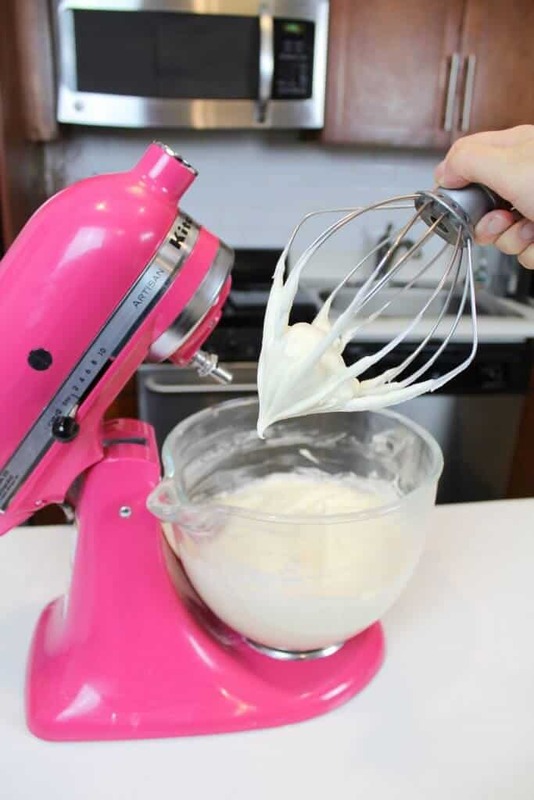 So unless you’re taking a really long time to add the second layer of frosting, I think that my first tip should help fix your problem, and keep your buttercream smooth and workable. Hope that helps Sarah!! Hi Chels. 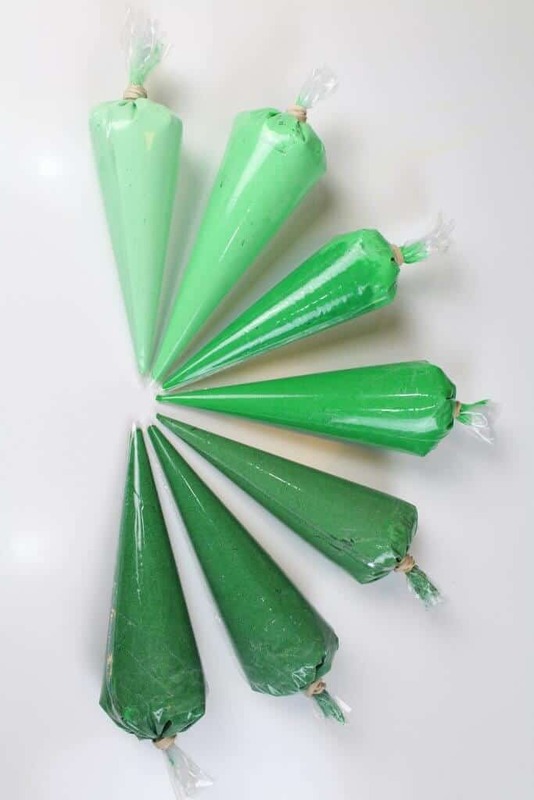 You mentioned one way of storing the buttercream are in piping bags ….. then you mentioned to get out some of the air bubbles to whip it in mixer or with spatula. …when finished do you put buttercream right back in the same piping bags? I actually find when I put them in bags, I don’t have an issue with air bubbles! It’s only when buttercream is stored in a large bowl or container that I run into that 🙂 Just another reason why I love storing frosting in piping bags!! Very interesting!!! Will try it out , thank you!! Hi Chels! I’m a novice cake decorator…when you store the buttercream in the bag, how do you get the tip on the piping bag? Or are you transferring it from one bag to another? I’ve been using a coupler, so maybe that affects this process…any tips you can give on easiest way to use various tips with your piping bags is great. I appreciate it! I don’t really use couplers often, but that is another way too! !